Are you tired of having so many keys to keep track of and organize? If you own or manage a property that utilizes many keys, you can consider having a locksmith in Portland produce a master key system for your locks. When there are multiple people who have key access to their own doorways and only one or two superiors who also possess a key to everyone’s doorway things can quickly get confusing. That’s why after a master key system is performed things are simple and organized. The multiple people who have a key to their own office or apartment still have one key to their place. The superiors who once before had a separate key to each room now only need to carry one key for better key management that will have the ability to open every door. This key, known as the master key, can open one or more locks that are not keyed the same. No other key within the apartment or office place will have the power of the master key. 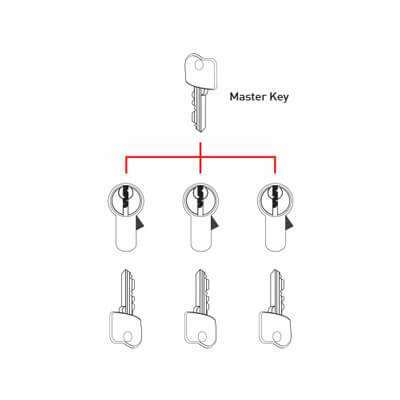 Master key systems can be extremely complex, involving multiple master, grand master, and sub master keys. What is the difference between a lock that has been master keyed and one that has not? The difference is that a master keyed lock will possess a master pin between each driver and key pin within the locking cylinder. Pins are tiny oval-like objects found underneath the springs located within locking cylinders that your key brushes against when it is entered. Don’t be too concerned about the security of your property, as a master key system actually enhances security because there are fewer keys to manage. To have a master key system performed on the locking mechanisms of your property you can call a Portland locksmith who is certified who you can trust possesses the knowledge and ability. They will possess the correct tools and knowledge in order to add the additional pins into the locking cylinder. Additionally, a professional commercial locksmith is able to create new keys that will match the new locking cylinder.